There's an old quote from Mister Rogers that has been circulating on Facebook since the Boston Marathon Bombings. "When I was a boy and I would see scary things in the news" Fred Rogers wrote in his book on parenting, "my mother would say to me, 'Look for the helpers. You will always find people who are helping.'" That idea - look for the helpers - is a thread that ties together so many disparate stories. It's an uplifting perspective changer on the news that is breaking in Boston on this Friday before Earth Day. And it is what drives our guest on CNN Profiles, who has nothing at all to do with the breaking news in Boston. 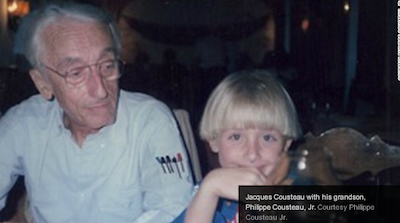 Philippe Cousteau's family made its name running in a direction others ignored - taking risks to document a breaking news story that impacts our security every bit as much as what we see unfolding in Boston. Are you a psychopath? Let's reframe that question. Do you fall somewhere on the psychopathic spectrum? The next Sandy is coming. Not tomorrow. But sooner and more often than we'd hope. Zolli travelled over 100,000 miles looking for the principles underlying resilience. So if you want insight into bouncing back, listen.